You are now able to refresh queries combining data from on-premises and cloud data sources. Improvements to the gateway support for DirectQuery over SAP HANA (preview). 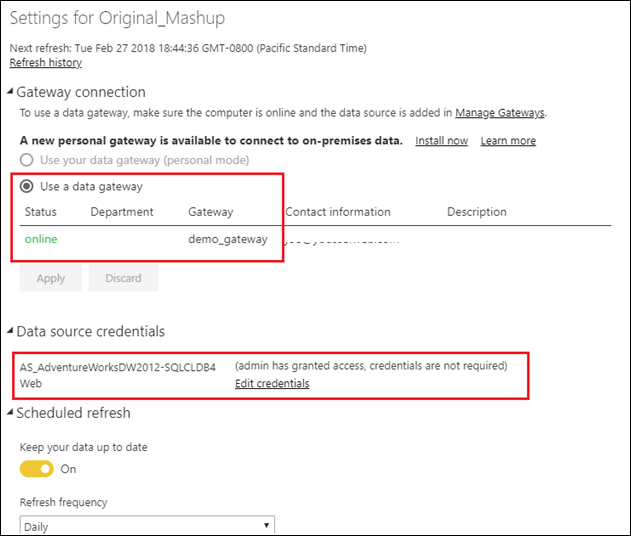 The on-premises data gateway now includes the February version of the mashup engine. Before we start talking about this month’s improvements, we wanted to reminder you that on March 15th, our support to on-premises data gateway versions that are older than the August 2017 release will end. We always recommend staying up to date with new releases but if you are using a release that is older than the August 2017 release, please upgrade to a newer version to ensure no disruptions to the gateway functionality. Please refer to our documentation here for more details and the reasons behind this change. This has been the top gateway ask from the community on our ideas website. Last year we enabled the ability to refresh Power BI Desktop files that retrieve on-premises data and cloud data in separate queries. A huge ask remained to enable the ability to merge or append data from those sources in the same query. We have been working on enabling that and we are happy to announce that you are able to do this now. After installing on-premises data gateway, go to the “Manage gateways” page and select the gateway you want to use. Under Gateway Cluster Settings, you’ll see a new checkbox that says “Allow user’s cloud data sources to refresh through this gateway cluster. These cloud data sources do not need to be configured under this gateway cluster”, make sure this box is checked (currently it is not checked by default). Add any on-premises data sources you are using in your queries under this gateway cluster as you do normally. You do not need to add the cloud data sources you are using in your queries. Upload the Power BI Desktop file that has the queries that combine the on-premises and the cloud data sources to the Power BI service. For the on-premises source, you can pick the gateway that has this source defined like you normally do. For the cloud source, you will be able to edit its credentials under “Data source credentials” as you normally do with any other cloud source. Once the cloud credentials are set, you can now refresh the dataset using the Refresh now option or schedule it to refresh periodically. Earlier this month, with the February release of Power BI Desktop, we announced improvements to DirectQuery over SAP HANA connectivity particularly around treating SAP HANA as a multi-dimensional source by default. 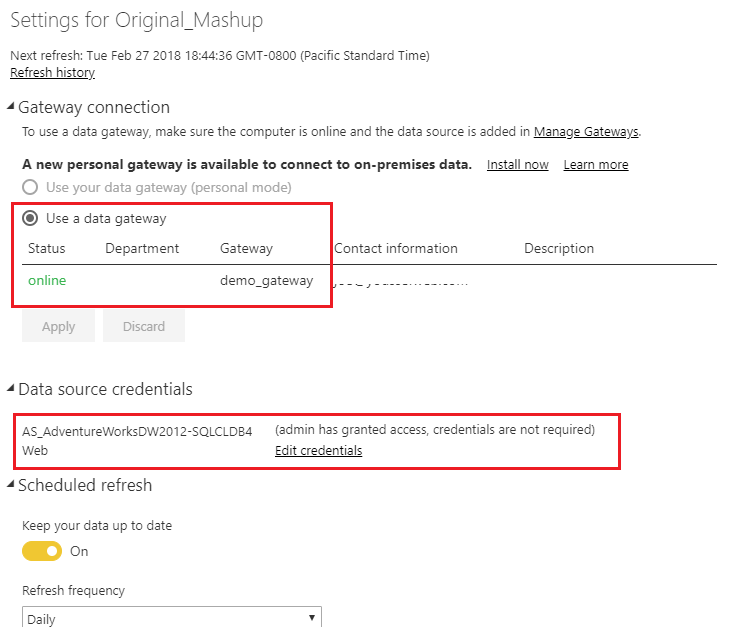 With this month’s gateway release, Power BI Desktop reports using that improved SAP HANA DirectQuery connector can be used with the on-premises data gateway as well. For more details on how to use this new improved SAP HANA DirectQuery connector in Power BI Desktop, please check our announcement earlier this month as well as our SAP HANA DirectQuery connectivity documentation.